To make these loaves, I added a handful of baby kale and whole head of roasted garlic. The kale added a nice dimension to the look of the bread, and the roasted garlic added an amazing aroma and flavor. It's pretty much garlic bread from within. Just toast slices of this bread, spread it with butter, and enjoy! So good. What is the stretch-and-fold method? Essentially, once you have briefly mixed the dough, either by hand or machine, you let it rest, and periodically stretch the dough over itself three to four times, usually at 30 minute intervals. It takes the place of kneading the dough to develop the gluten. This dough is very forgiving. Once you get used to handling wet dough, you will absolutely fall in love with it. Just keep a dish of water nearby in which to dip your hands before handling the dough. Because this dough is fermented in the refrigerator, it has lots of time to develop flavor. The longer the dough ferments, the more flavor is developed. Dip slices of this bread in olive oil and balsamic vinegar. I also spread it with this white bean dip. Delicious. Mix the dough and perform 4 stretch and folds over a period of 40 minutes. Cover the dough and refrigerate overnight, and up to four days. Remove the dough from the refrigerator, let it lose its chill, shape, and bake the loaves. How do I roast the garlic? Cut the top off of a head of garlic, place it on a piece of foil, and drizzle it with olive oil. Wrap it up, and bake it in a 400 degree F oven for about 25 to 30 minutes. Let cool. Squeeze the cloves of garlic from its paper and mash it. Set aside to incorporate into the dough. 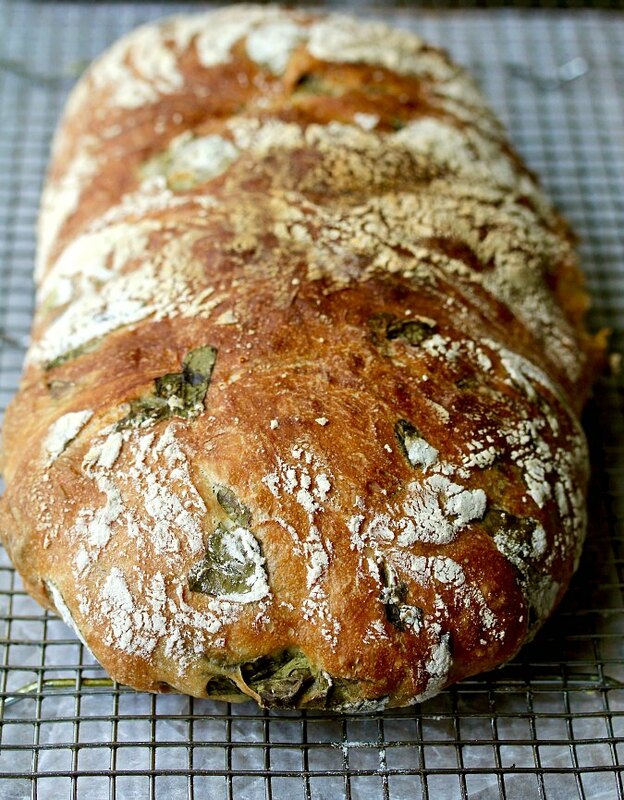 This month, the Baking Bloggers are presenting recipes with garlic. It seems pretty appropriate for October, better to keep the vampires at bay. After the recipe, be sure to check out the rest of the recipes that include garlic. Many thanks to Sue of Palatable Pastime for starting this group, and Wendy of A Day in the Life on the Farm for helping out. Combine the flour, salt, yeast, and water in the bowl of a stand mixer. With the paddle attachment, mix on low for one minute. Let rest for five minutes. Drizzle the olive oil over the dough and mix on medium low for one minute with the paddle attachment. Transfer the dough to lightly oiled dough rising bucket or bowl and cover with plastic wrap. Let rest or 10 minutes. Stretch and fold the dough with wet or oiled hands from all four "sides" and form the dough into a ball. Let rest for another 10 minutes. Repeat 3 more times within the next 40 minutes, adding the kale and the garlic during the final stretch and fold. Cover the dough bucket with plastic wrap and refrigerate for at least 12 hours and up to four days. When you are ready to bake, remove the dough from the refrigerator. Let rest for 1 hour. Line a baking sheet or pizza peel with parchment paper and generously dust it with flour. Gently transfer the dough to your work surface. Dust the top with flour and stretch it out to a 9 inch square. Cut the dough in half. Gently fold the dough in thirds, like a letter. Don't apply any pressure. Lift the dough and place it on the floured parchment paper, seam side down. Cover with oiled plastic wrap. After an hour, roll the loaves so that they are seam side up and stretch them out to seven inches in length. Flip the dough over one more time so that the seam is at the bottom. Shape with a dough scraper to tuck the sides under. Cover with oiled plastic wrap. Proof for one hour. Heat the oven to 550 degrees F with a baking stone on the middle rack and a broiler pan on the bottom rack. Place the dough, parchment and all, onto the stone. Add 1 cup of hot water to the broiler pan and lower the oven temperature to 450 degrees F.
Bake the loaves for 27 to 35 minutes, until the crust is a deep brown. Cool on a wire rack for 45 minutes before slicing. At first I thought it was black garlic I was seeing in this wonderful bread but now I understand that it's the kale. 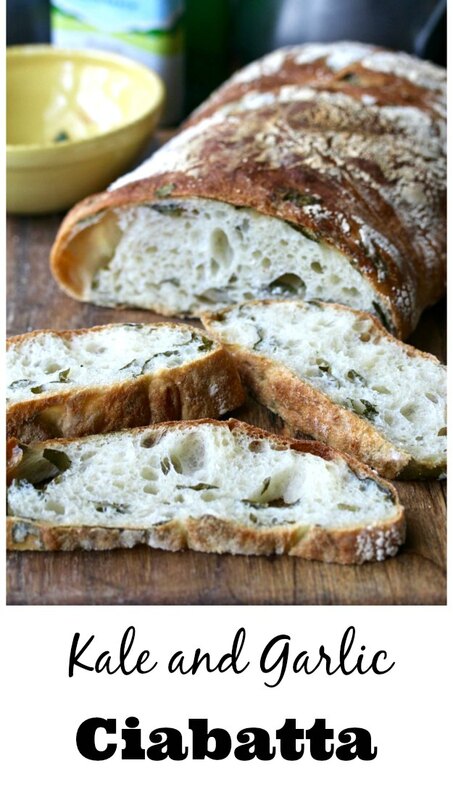 What a great idea to add kale to the bread!! You can't really taste the kale, but I like the dimension it adds. I love the greens peeking out from the lovely texture of your crumb, Karen. What a beautiful loaf! You are my bread baking idol! Love that you added kale, and the white bean dip topping sounds perfect. 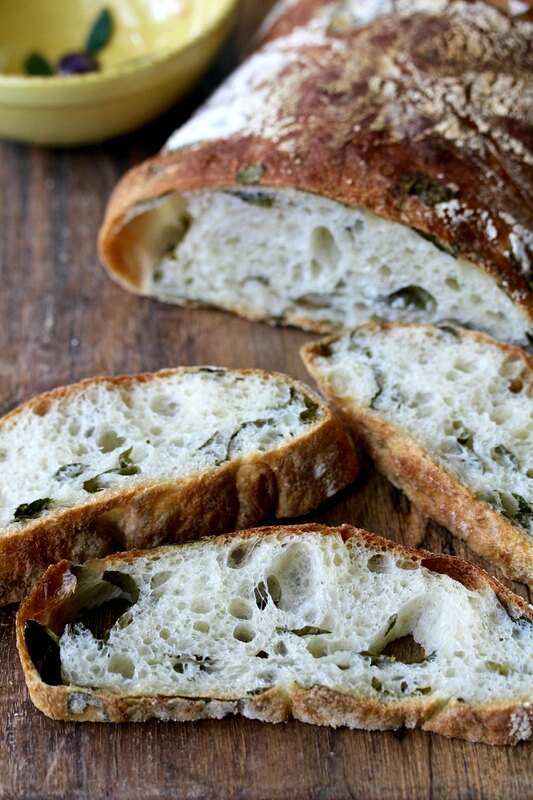 Beautiful texture of the bread and love the greens peeking out. Awwww. Thank you! I need to cut back a little actually. My goal was 12 posts per month, but I've gone a little crazy. Fortunately, I have a lot of photos stuff I've never posted, so when it fits into an event, I do that rather than make something new. 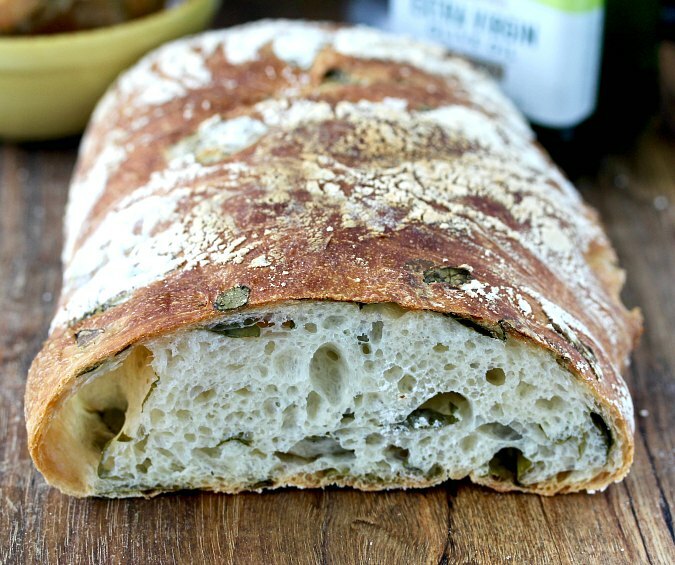 This bread looks wonderful both inside and out! Thanks Sue! This dough is amazing to work with. OMG this bread looks simply Devine. Such a gorgeous piece of loaf. I would love to have it with some cheese.